Pete’s Tire Barns carries ATV Tires, UTV Tires and Quad Tires for many different applications. 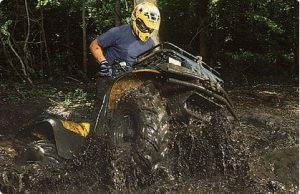 Turf ATV Tires, Trail ATV Tires, Mud ATV Tires and more. ATV tires that are powerful, rugged and built to last. Are you an off road enthusiast in need of reliable ATV tires? Do you constantly long for tires with real grip and durability? Something to enhance your off-road experience? We’ve all been there. Tires that let you down at the worst possible moment! But when you’re trekking across dangerous terrain, the very last scenario with which you want to be faced is a dreaded punctured tire. Not only does that present possible damage to your ATV itself, given the likelihood of an accident, but also presents a danger to you. So what is the solution? How is it that our tires are safer and sturdier than those of our competitors? Well, we’re glad you asked. Whether you are looking for tires for a UTV or a quad, we cover machines of all shapes and sizes. We are devoted to the highest quality of tires to allow for the smoothest bumpy ride of your life. Whatever the terrain, whatever the wear, we have you covered. We size your tires perfectly, down to a tee, and we know exactly what you should be looking for when you buy a new set of tires. We don’t want to trick you or simply take your money. We want you to have the best riding experience possible – tires are our only business! We ensure that your tires have the correct ply rating and that the tread pattern is efficient and effective for whatever level of activity or on whatever style of terrain you will be riding. What do you get from us that other tire manufacturers cannot provide? The question is not what we are like, but what we do for you as our customer. The truth is that we care about our customers. We care about you as a fellow ATV rider and not simply another customer. Our reviews can attest to that. We ensure that your tire is not only well designed, but safe and reliable too. We have a reputation to uphold and our track record proves it. So if you’re interested in renewing your favorite ATV without ever having to worry about ill-timed and easily avoidable accidents, then come to us for the best ATV tires on the market!